Last week, if you follow my sisters blog, she showed you the first ladybug of the season. Well, here in New Brunswick the ladybugs have just come out here. Mitchell (who is making a face) and Caitlin and their friend Madison are going to be ladybugs in the school choir concert early next week. 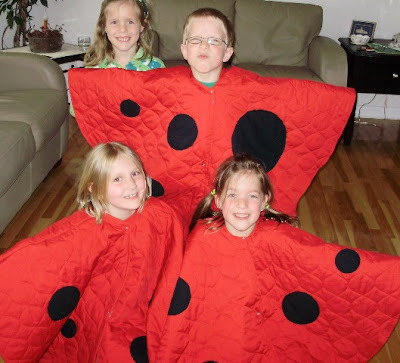 So this week, I made some ladybug costumes for them just in time for the dress rehearsal. Grace is in the choir too but she decided not to take part in this ladybug performance. Gail, these costumes are just waaay too cute!! You are such a good Grammy!